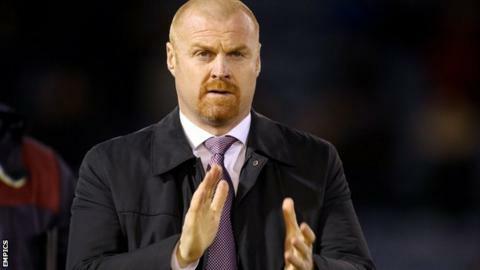 Sam Vokes scored his 10th goal of the season to earn victory over Nottingham Forest and keep Burnley in second place in the Championship table. A resolute rearguard and some fine goalkeeping from Dorus de Vries kept Forest level in the first half. And despite improving after the break, they trailed when Vokes anticipated a clever Andre Gray dummy and swept the ball in. Forest pressed late on but the hosts held on without too much alarm. The Reds struggled to create opportunities throughout against a defence which has now not conceded a goal in winning three of their last four games. And only Hull's victory at Ipswich prevented Burnley from going top of the table. They had to be patient after finding De Vries in fine form to deny David Jones, Gray and Vokes in the first period. Forest could have gone ahead after the break but Jamie Ward shot over when well placed. And, after Vokes scored from close range after 68 minutes, Burnley were able to close out victory. "We've been going strong down the leagues since I got my own group together. "There's a fantastic mind-set, physicality, belief in what we do. We train right all the time, deliver right all the time. "I have absolute faith in my group getting stronger and stronger. "The stats now are as strong as they've been all season, physically. I've got no reason to over-think it." Match ends, Burnley 1, Nottingham Forest 0. Second Half ends, Burnley 1, Nottingham Forest 0. Nélson Oliveira (Nottingham Forest) wins a free kick in the defensive half. Attempt missed. Jamie Ward (Nottingham Forest) left footed shot from outside the box is high and wide to the left following a set piece situation. Gary Gardner (Nottingham Forest) wins a free kick in the attacking half. Corner, Burnley. Conceded by Bojan Jokic. Attempt blocked. Gary Gardner (Nottingham Forest) right footed shot from outside the box is blocked. Foul by David Jones (Burnley). Substitution, Nottingham Forest. Jorge Grant replaces Ben Osborn. Substitution, Nottingham Forest. Chris Cohen replaces Robert Tesche. Attempt missed. Robert Tesche (Nottingham Forest) left footed shot from outside the box is too high. Attempt blocked. Nélson Oliveira (Nottingham Forest) left footed shot from outside the box is blocked. Assisted by Eric Lichaj. Attempt blocked. Andre Gray (Burnley) right footed shot from outside the box is blocked. Stephen Ward (Burnley) wins a free kick on the left wing. Joey Barton (Burnley) wins a free kick in the defensive half. Substitution, Nottingham Forest. Dexter Blackstock replaces David Vaughan. Attempt missed. Andre Gray (Burnley) left footed shot from the right side of the box misses to the right. Assisted by Sam Vokes with a headed pass. Andre Gray (Burnley) wins a free kick in the attacking half. Attempt missed. George Boyd (Burnley) left footed shot from the right side of the box is close, but misses to the right. Assisted by Sam Vokes with a headed pass. Goal! Burnley 1, Nottingham Forest 0. Sam Vokes (Burnley) left footed shot from the centre of the box to the bottom right corner. Assisted by Stephen Ward. Attempt missed. Jamie Ward (Nottingham Forest) right footed shot from outside the box is too high. Corner, Nottingham Forest. Conceded by Ben Mee. Sam Vokes (Burnley) wins a free kick in the defensive half. Corner, Nottingham Forest. Conceded by George Boyd. Corner, Nottingham Forest. Conceded by Stephen Ward.